I’m checking today to make sure I have everything I need for that good old Thanksgiving classic Turkey and Southern Cornbread Dressing. 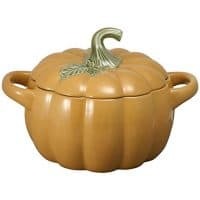 This is always the star of the show at our Thanksgiving dinners. The side dishes may change. The desserts may be varied. But there is always, always turkey and dressing on the menu. Of course, I know that there are those who will debate the differences in dressing and stuffing. I suppose there are merits to each, but dressing is our tradition. Some people say that the difference is simply that stuffing is cooked inside the turkey and dressing is cooked in a separate dish. In my experience, there’s a great deal more difference than that. The type of cornbread dressing that I grew up with was as different from stuffing as night is from day. Stuffing has cubes of bread or cornbread with other wonderful additions. Vegetables, sausage, even fruit. But dressing is of a completely different texture. The cornbread is broken down to be more homogenous with the other ingredients which are typically not much more than onions, celery and stock. It’s also given some lift during the cooking by the addition of beaten eggs. The result is more akin to what southerners would call “souffled,” the cornbread having been lifted and lightened by the addition of the eggs. What follows is, with minor modifications, my mother’s recipe for cornbread dressing. Now my Mama is the undisputed Queen of Southern Cornbread Dressing Makers. She holds the title and everyone in the family knows it. We’re all crazy about her dressing and she always makes far more than is needed to feed the crowd because we all want to take home some of the leftovers. When BeeBop and I were newly married and living far away from our southern home, Mama wrote down her dressing recipe and mailed it to me (yes, mailed it; there was no email in those days). That was 30 years ago, and I’ve used her handwritten instructions ever since. It makes me feel like she’s right there in the kitchen cooking with me. If you want to treat your family to some authentic southern cornbread dressing, give my recipe a try. Start by making a type of cornbread that we call egg bread. The egg bread should be room temperature, so it’s easiest to make it the day before you make the dressing. 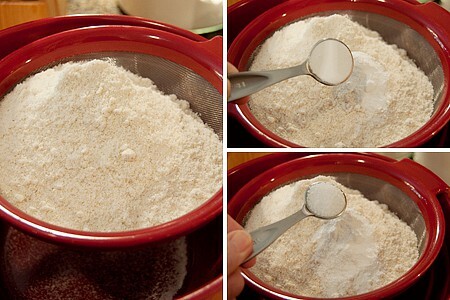 Sift together the cornmeal, baking powder and salt. Add buttermilk and eggs, alternately. Pour the cooking oil into an iron skillet and place it into the hot oven. Let the batter rest while the skillet and oil are heating (about 5 minutes). Quickly pour the batter into the hot skillet and return immediately to the oven. Bake for 20-25 minutes. Set aside the egg bread until you’re ready to make the dressing. I always make the egg bread a day or two in advance and refrigerate it until it’s needed. Just a little note here – people often ask me if they can assemble the dressing a day ahead and bake it when needed. I do not advise doing that simply because cornmeal (and, therefore, cornbread) is very, very absorbent. The longer it sits, the more liquid it absorbs. If you made up your dressing the day before baking, it would turn out very dry because the cornmeal would have taken up all the liquid. This type of dressing is meant to be quite moist when served. Chop the onions and celery. 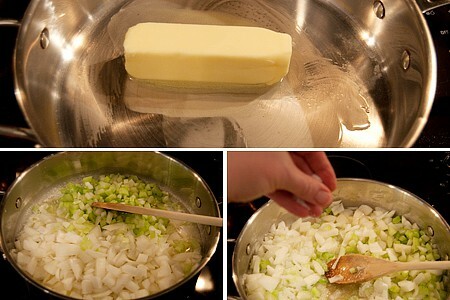 Melt the butter over medium heat in a large sauté pan. Yes, a whole stick of butter. This makes a huge dish of dressing so you probably won’t even get a half a tablespoon of butter in your serving. And anyway, it’s Thanksgiving, for Pete’s sake. Indulge! Add the onions and celery cooking slowly until tender but without browning at all. Sprinkle with the 1/2 tsp. salt while cooking. Meanwhile, crumble the egg bread into a large baking dish. Just break it up as small as you can with your hands. Don’t worry about it too much, you’ll work out the finer texture a little later. Add the soup and broth and then grab your potato masher. Yes, I said potato masher. Use the potato masher to break up the egg bread to a finer texture. You want as few lumps as possible. Add the sautéed vegetables, salt, pepper and poultry seasoning. Mix well. Stop here and taste the mixture. You may need a little more salt. Remember, that’s a big dish of dressing to season. Lightly beat the eggs and add to the dressing mixture. Your mixture should be fairly “soupy.” If you think it’s too thin, you can add some additional bread, crackers, etc. to thicken it. However, it’s rarely too wet. Even if you think it’s too wet, it’s probably not. It took me a long time to learn that. It’s just one of those cook-by-feel lessons that you acquire through making a traditional recipe over and over. 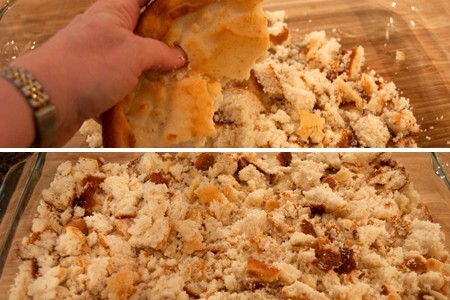 If you do add more bread or crackers, be sure to crumble them well and incorporate them into the mixture. Bake for 35-45 minutes or until the dressing is golden brown on top and cooked throughout. Of course, Thanksgiving wouldn’t be complete without the turkey! Here’s my simple method for cooking a beautifully moist turkey with a golden, crispy skin. If your turkey is frozen, allow it to thaw unopened in the refrigerator. Allow at least 24 hours for every 4 pounds. When thawed, keep in refrigerator until ready to cook. Remove the turkey from its packaging and, using disposable paper toweling, pat dry very thoroughly. Just look at that turkey in the upper left! I opened the packaging to find the skin split in several places. Grrr…thanks a lot Publix. Anyway, if that happens to you, don’t panic. Just do some toothpick surgery like I did. Pull the edges of the split skin together and use toothpicks to secure it. Remove the toothpicks before serving. If using a whole turkey, tuck the wing tips underneath the body and tie the legs together with twine. Place the turkey on a rack in an open roasting pan. 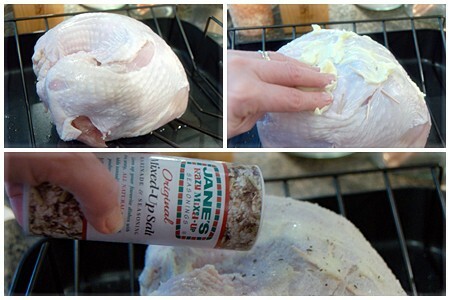 Rub the skin all over with a generous amount of softened, room temperature butter. Sprinkle well with salt and pepper, a seasoned salt mixture, or your favorite combination of spices. Place the pan in the oven and set a timer for about 2/3 through the cooking time. When the turkey is about 2/3 done, check for browning. 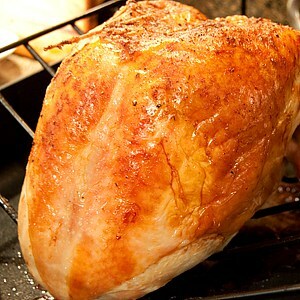 You may need to cover the breast and top of drumsticks with lightweight foil to prevent over browning. Test for doneness with a meat thermometer. A thermometer placed deep within the thigh should read 180 degrees when done. Remove from oven and let stand at least 15 minutes before carving. An authentic recipe for traditional southern cornbread dressing and an easy turkey cooking method. 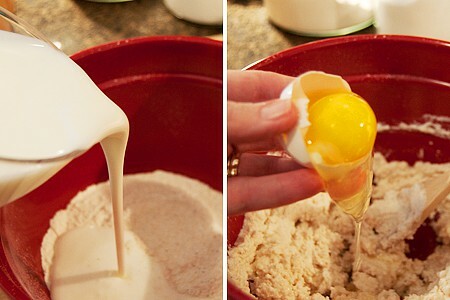 Start by making the egg bread. The egg bread should be room temperature, so it’s easiest to make it the day before making the dressing. See directions below. Preheat the oven to 400 degrees. Chop the onions and celery. Melt the butter over medium heat in a large sauté pan. Add the onions and celery cooking slowly until tender but without browning at all. Sprinkle with the 1/2 tsp. salt while cooking. Meanwhile, crumble the egg bread into a large baking dish. Add the soup and broth and mix well using a potato masher to break up the egg bread to a fine texture. Add the sautéed vegetables, salt, pepper and poultry seasoning. Taste and adjust for more salt if needed. 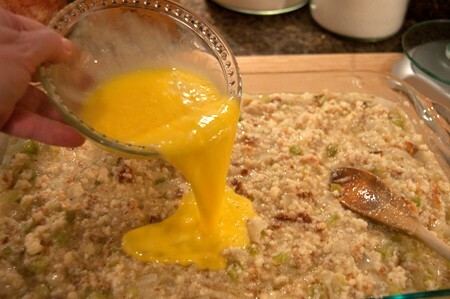 Lightly beat the eggs and add to the dressing mixture. Your mixture should be fairly “soupy.” If you think it’s too thin, you can add some additional bread, crackers, etc. to thicken it. Be sure to crumble them well and incorporate them into the mixture. Preheat the oven to 450 degrees. Sift together the cornmeal, baking powder and salt. Add buttermilk and eggs, alternately. Pour the cooking oil into an iron skillet and place it into the hot oven. Let the batter rest while the skillet and oil are heating (about 5 minutes). Quickly pour the batter into the hot skillet and return immediately to the oven. Bake for 20-25 minutes. Preheat the oven to 325 degrees. Remove the turkey from its packaging and, using disposable paper toweling, pat dry very thoroughly. If using a whole turkey, tuck the wing tips underneath the body and tie the legs together with twine. Place the turkey on a rack in an open roasting pan. Rub the skin all over with softened, room temperature butter. Sprinkle well with salt and pepper, a seasoned salt mixture, or your favorite combination of spices. When the turkey is about 2/3 done, cover the breast and top of drumsticks with lightweight foil to prevent over browning. Test for doneness with a meat thermometer. A thermometer placed deep within the thigh should read 180 degrees when done. Remove from oven and let stand at least 15 minutes before carving. I don’t remember sending this to you, but I know I did because you said so and that is my handwriting in the picture. Wish I could still write that ledgible now. This looks delicious! My grandma and my mom both make cornbread dressing that is very similar to this, and just like your family…that’s the highlight of our holiday meals! I think everybody in our family would faint dead away if we didn’t get some of this dressing on Thanksgiving Day :-) It just wouldn’t be Thanksgiving without it. Wow this dressing looks great! It’s very similar to what I grew up eating at Thanksgiving…yum! this so similar to our dressing, one handed down from my grandmother that we enjoy with loving mouthfuls during the holidays (and sometimes with baked chicken during the other times)…. hers follows the addition of a baked hen, and chopped boiled eggs to make enough that feeds an army, so good…. seeing your beautiful dressing makes me want some right now…. Well, Stephanie, I’m so glad I could introduce you to dressing! Maybe you’ll give it a try sometime. Yes, that’s dressing all right. It is also the star of our Thanksgiving table. I can remember my Grandmother mixing it in a dishpan (she needed to make so much) and not using a potato masher, but her hands. She’d then bake it in a huge iron skillet. If that doesn’t get one in the mood for Thanksgiving, I don’t know what would! This stuffing looks awesome! Of course, I’ll probably never sway from my mom’s on Thanksgiving, but this is definitely a stuffing I’d like to give a try! Happy almost Thanksgiving!! Dressing and stuffing are two different things. I thought everybody knew that. Looks delish! I love dressing (although I’ve always called it stuffing) and think it’s the best part of a Thanksgiving dinner! I love family tried and true recipes! They are always the best and these pictures prove it! Forgot to ask – what size is a large baking pan ? Thanks for asking. I use a 9×13 pan Pyrex dish for mine. I have been searching all over the internet for a dressing recipe. This looks great! What size is the egg bread? I cook it in a 12″ skillet. Is that what you mean? How much ingredient for 100 people? Hi Jennifer – I have to say I’ve certainly never made this recipe for 100 people, but since it serves about 12 I’d multiply the ingredients by 10 to get an estimate. I’m making dressing for the first time this year (instead of my mom) and my husband says he likes it soupy…when cooked, is your recipe a little soupy or should i just add a little extra broth than the written recipe to make it that way??? thanks so much! Hi Meredith. My dressing is not soupy when it finishes cooking. Honestly, I’ve never heard of a “soupy” dressing. You might make a dressing recipe and then offer some gravy or warm broth at the table when it could be added by those who want a soupier dressing. I have searched endlessly for a dressing recipe to mimic my late mother-in-laws. My only question is can I make the egg bread in a 8×8 square pan, I don’t have a cast iron skillet. Oops another question does the bread mix have to be sifted I don’t have one of those either. The recipes looks great can’t wait to make it tomorrow. Anika – Yes, you can cook the egg bread in another type of pan. If it doesn’t all fit in an 8×8, use a different pan for the remainder. You do not have to sift the cornmeal if you don’t want to. If there’s no dressing, there’s NO Thanksgiving! That’s just how it is. And it far surpasses stuffing. :) Happy Thanksgiving to you! I’m going to be making a gluten free cornbread this Thanksgiving, too. But I’m making it Southwest style with chorizo! 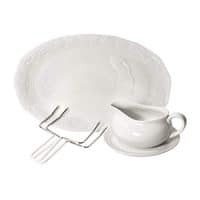 A must have in our Thanksgiving table. I love this side dish. Oh that stuffing looks nummy. I am so excited for Thanksgiving ;D We always make a wild rice stuffing and oyster dressing. Aha!! Ok, so this is dressing!! Well, since your mama’s recipe is the best, I think I definitely need to try it! Being Canadian, we celebrated our Thanksgiving in October. The second Monday of October to be exact. I’ve often wondered why the difference in the two, but it seems the powers that be of each country are the deciders of what will be when. I do love seeing all the Thanksgiving recipes available online for the upcoming US Thanksgiving though, its interesting to see how and if we differ much with what we serve at Thanksgiving. I’ve found it’s not much different at all really, except when it comes to the stuffing/dressing. I find many US stuffing recipes tend to call for cornbread, whereas here where I am, bread crumbs or cubes are the norm for stuffing, with cornbread becoming a bit more popular every year. In my home, being born of and raised by, British parents, sage and onion stuffing, with or without sausage meat, is a must. 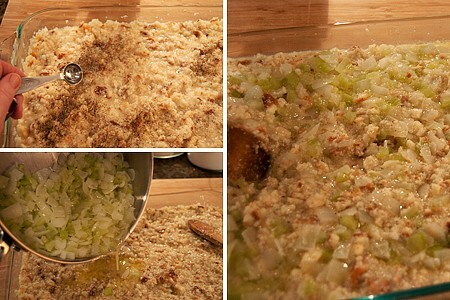 I’m not sure I, Mom, Grandma of 8, would be very popular if she changed her secret stuffing recipe after so many years! I do have the perfect person to try your stuffing recipe on though. I’ve been assisting an American neighbour, a widow, who was stricken with MS some years back. When American holidays occur, my neighbour is usually okay being so far away from home, but when American Thanksgiving is to occur, my neighbour gets quite sad, as it’s the holiday that’s she misses the most. I always try to make a little something Thanksgivingish to perk my neighbour up, and I’m pretty sure, since she loves cornbread in any form, at any time, a smaller version of your stuffing along with a roasted turkey leg or thigh, will do wonders! Thanks for posting your Mothers stuffing recipe Lana, and all the other fantastic recipes you graciously give us, it is very appreciated. Hi Jocelyn – Just to clarify, the cornbread dressing is traditional in the southern U.S. However, many, many people serve a stuffing like you described. You might ask your neighbor which style she prefers. If you want to make her something that is very common for Thanksgiving throughout the U.S., I’d suggest a pumpkin pie. Oh yes, I know your dressing/stuffing is more southern, and I’m quite sure that’s why my neighbour will love it so much. As for the pumpkin pie, it’s a favourite of her’s and mine. We do quite well seeing who can eat the most! Thank you thank you thank you! 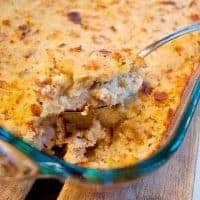 I’ve been looking for a traditional southern egg bread dressing recipe online for a couple of years and have always come up short! 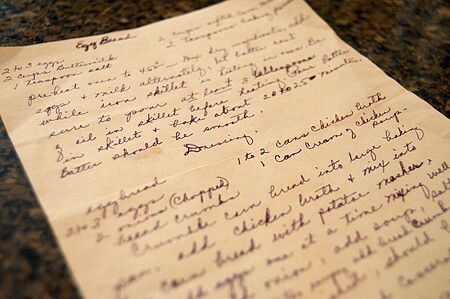 This is the recipe I remember making with my grandmother. And, in response to another commenter, our dressing was always “soupier” than most; which my grandmother accomplished just by adding extra broth. I’ll be making my eggbread today. Happy thanksgiving from Augusta, GA! Will be trying your recipe in the morning, but already have my cornbread portion baked and crumbled for my dressing along with my white bread crumbs. But will go by the rest of your ingredients for Thanksgiving dinner tomorrow. I just can’t wait. Thank you for your picture instructions and for sharing your recipe. Will try your ‘egg bread’ recipe for Christmas dinner. Thanks for putting this on here! It is the same way my grandmother used to make her dressing. This has worked for me all my life and my sister soo why try and change such a good thing? yours truly Shirley Strickland Happy T hanksgiving to you and yours! I made this last year and it was the best dressing ever! We all loved it. I am making it again today. Thanks for the great recipe. 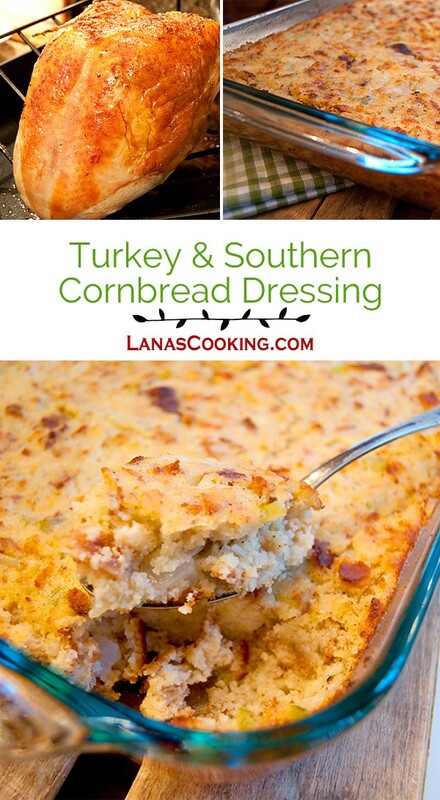 I am so excited to find this recipe as I have been looking for a true southern cornbread dressing for a long time. This sounds fabulous and I will be trying this for Christmas. Thank you so much!! Hi Lana, I love your site! Can’t wait to try these wonderful southern recipes; so many to choose from! I started with this one. I made your dressing for Thanksgiving dinner and it tasted amazing! But I had texture issues I was hoping you might help me with. Mine turned out crumbly. I followed your recipe exactly, with two changes. I added chopped boiled eggs. And I assembled it the night before, refrigerated overnight, then baked it the next day. Do you think my changes could have caused the crumbly texture? I allowed a longer cooking time since it was cold, and it was hot and golden on top when removed it from the oven. It seemed like if I cooked it longer it could have dried out (or at least that was my fear). But do you think I should have cooked it longer? Any insight would be much appreciated! Thank you! Hi Kelly – The eggs wouldn’t have affected it at all, but the prepping ahead would. If the dressing is prepped and held overnight, it would definitely dry out. The cornmeal/cornbread would absorb so much of the liquid that you would definitely get a dry, crumbly texture. What I always do is cook my cornbread the day before and store it in the fridge overnight. Then prepare your dressing when you’re ready to cook it the next day. Thanks so much, Lana! Can’t wait to try it again on Christmas! I am making dressing for the first time for Christmas this year and yours look so good and I will be cooking it, wish me luck. this will be my first Christmas that I have cooked for my Husband we alway go to his mom’s for Thanksgiving and Christmas but this year I want to cook. Good luck to you, Anna! Hope it turns out perfectly. I’ve been looking for a recipe like my grandmother’s and mother’s similar to this. They put meat from the Turkey neck bone, raw egg, chopped boiled egg, chopped giblets with broth, celery, onion, and sage. They used a cornbread made in a skillet using a recipe with flour. What would be the difference in using eggbread rather than cornbread? My family was from Alabama.? I have to let you know this is the best corn bread recipe I have ever had. I made this for Christmas but unfortunetly my husband and I both came down with the flu so we didn’t get to enjoy it. But here it is March and I decided to make this recipe today. It was excellent and alas we did get to enjoy it! Thanks again for sharing your recipe. I’m so pleased that you enjoyed my recipe, Judy. Actually, it’s my mom’s recipe and the only one our family has used for years and years. Hope you’ll visit the blog again and fine more delicious things to cook for your family. Just discovered your blog and am so glad I did. This looks amazing. 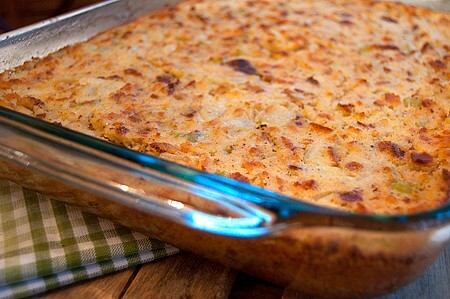 I love cornbread dressing and attempted to make a batch last thanksgiving without success. Your version looks like a real winner. I can’t wait to give it a try. I will try your recipe tomorrow.I know it is going to turn out goodbit the same recipe think that my mom use to make. The southern cornbread dressing was incredible and easy. This was not first time to make dressing and your instructions made it easy. How do you make turkey gravy? My mother is 83, in a nursing home with Parkinson’s; she was the best cook ever. Last year I tried to make her dressing, but it was too dry. Mama also put leftover biscuits, etc. in it, along with a fried white corn meal “hoecake.” She learned a lot about cooking from my dad’s mother. She did not make an eggbread; and she added chopped boiled eggs and the turkey giblets. This was my favorite dish of any holiday, hands-down. I may try this recipe, and tweak it towards my mother’s version. I’m so glad to find an on-line version of this incredible culinary delight. i love this.. this is almost the same way my mama made it and i do now. I was raised in the south..although moved several times away and still love this type of southern cooking! Your site brought me back to when i was younger..thank you for this!! Have a wonderful Thanksgiving and remember why we can celebrate our freedom!! Thanks be to our Lord! It’s included in the poultry seasoning. We don’t like much sage in our dressing, Vicky, so that little bit works just fine. You can add as much as you like. 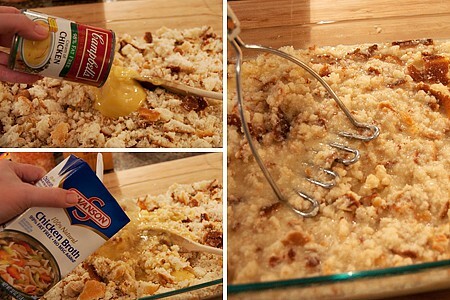 This is the best cornbread dressing ever! I tried so many other recipes and then found this one. This will be my third year making it. The only thing I do differently is use Trader Joe’s cornbread mix instead of making my own egg bread. It still turns out great! I’m so glad y’all like it, Tracey! I made my cornbread yesterday and I’m just about ready to get in the kitchen and mix up the dressing. It’s always the star of the table here on Thanksgiving. Can I prepare this the night before then bake the next day? Just want to make sure it doesn’t soak up all my “wet” ingredients and end up gooey the next day … This recipe looks so much like what my mom used to make .. but we never got her recipe perfected. Thank you for posting this!! Debbie – if you make the dressing the day before, I’m pretty sure you’d need to add more broth to it before cooking. The cornbread would really soak it up overnight. What I do is this – the day before I make, cool, and crumble the cornbread and store it in a large zip bag. I also saute the onions and celery, cool that and store in the fridge overnight. On Thanksgiving I mix everything together and bake it off. Just takes a few minutes to put together. Our church had it’s Christmas Luncheon today and I asked who made the stuffin’. Blank looks. I was told the Yankie in me came out (was born in NY but raised in South). That in the South, it’s called dressing. In the North, it’s stuffing. Who knew! So I came home looking for a cornbread DRESSING recipe and came across this page and the comments on stuffing vs dressing. Too funny! Sometimes, when I read recipes of yours, I just well up with tears…. It’s like reading recipes from either one of my late grandmomma’s, my aunts, or my own mothers recipe boxes. And its so funny to read people’s remarks about “dressing vs. stuffing”. As a southerner, I didn’t know what stuffing was until I was in my 20’s! All I ever knew was that we had “dressing” on Thanksgiving! We’ve never added the chicken soup either, momma always used the broth from the turkey necks & gizzards that she eventually turned into giblet gravy to serve along side the meal (and the dressing of course). It’s still the most favorite part of our Thanksgiving meal. Thank you so much for sharing these recipes and memories with us. Angelita – I just have to tell you how much your comment means to me. I even shared it with my Facebook followers. It’s comments like yours that keep bloggers like me going when we’re not sure whether it’s worth all the time, cost, and effort. Thank you from the bottom of my heart. Good question, Connie! And honestly…I’m not sure. I have not in all these years tried freezing the dressing. I do prepare it ahead of time by cooking my cornbread a day or two in advance and sauteing the vegetables. I have that all ready to go in the fridge and just pull it out and mix it up on Thanksgiving morning. You can mix it early in the day and let it sit in the fridge, but be sure to bring it to room temperature before baking. Also, if it has been standing for a while, be sure to check whether it needs a bit more broth. That cornbread really soaks it up! Lana, I am so excited that sweet people like you still exist in this world. I am 33 yrs old and not a very good cook but I try. I want to cook homemade dressing for Thanksgiving but was afriad I could not do it. This step by step recipe reafirmed my faith and with this I know I can do it. I was 23 when my mom passed away and my dad just passed away 6 months ago. They were both wonderful cooks!!! This recipe brings tears to my eyes, its what I remember eating when I was a kid. Thanks again and wish me good luck. Amanda – comments like yours are what make all the work involved in a food blog totally worth it! Here’s wishing you all the luck in the world! By the way, I’ll be monitoring my email all during Thanksgiving. You just email me any time if you have a question about the recipe. I’ll be happy to try to help! There was a recent pin on Pinterest showing family recipes framed with a burlap mat. Your handwritten recipe needs a linen mat and a place of honor. Can I use jiffy cornbread mix? I usually do and I think it’s sweet but the fam likes it. I just add sage, poultry seasoning, s/p, broth and celery so it’s plain but the sweet gives it a little more interest. I want to change it up but not too much and this looks great! I just bought my cornbread mixes tho. Would it work? Hi Christy – If you want an authentic taste, Jiffy won’t work. First, it’s yellow cornmeal instead of white and secondly, it’s way too sweet. It also has a very different texture than this egg bread. It’s okay sometimes, I guess, but it won’t make *this* recipe correctly. Ver similar to my moms dressing. I’m tryin yours now! Can I prepare it all tonight and refrigerate it until I cook it tomorrow? Theresa – it will absorb too much liquid if you mix it up tonight and it’ll be very dry when you bake it. I don’t advise mixing it in advance. 32 oz. chicken broth or stock is for if you only do one pan of egg bread correct? so I should just double all of that if I make two or three egg breads correct? Yes, the recipe as written is for one batch of dressing using one pan of egg bread. THis recipe is the one I chose as my first time ever making dressing. IT IS AMAZING! All the guest said it was the best they ever had. For years, into my adulthood, I wondered what made my paternal grandmother’s dressing so special. Finally figured out that it was the addition of rosemary. Lana, I have to thank you for posting this again! I think this post is how I found you a few years ago, and I’ve used your egg bread & dressing recipes for the past 3 or 4 years. It gives me that wonderful southern cornbread dressing like my mom and MIL used to make. Thank you thank you thank you, and Happy Thanksgiving to you and yours! I made the egg bread today – I am planning on putting the dressing together tomorrow morning then refrigerate it overnight and then cook it on Thankgiving day. Is this a good strategy? If I cut the recipe in half how much bread crumbs, saltine crackers and stale bread should I add? 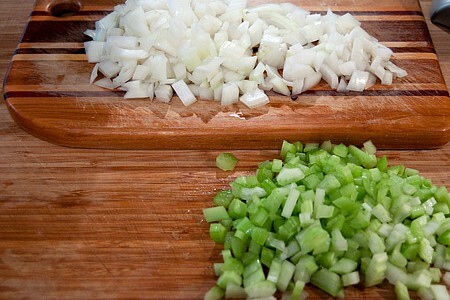 Can I blend the onion and celery after they are sautéed? My husband doesn’t like the texture. You’ll have to add a good bit more liquid if you let it sit overnight. The cornbread absorbs a massive amount of liquid in a short time. I never make mine ahead of time. 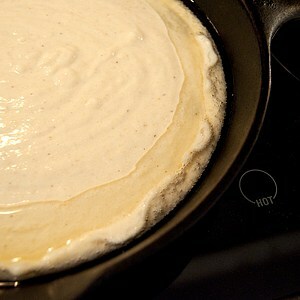 Question I don’t have a case iron skillet can I bake it in a pie pan or glass dish? You can bake it in any ovenproof dish. Truly, absolutely, still after so many decades, the absolute best food on the planet. Mama is indeed the Queen of Dressing. Yes, she is! No doubt. Your Mamma is one I have been highly blessed to know for years. She is one of the most spectacular star cooks in the south. Her creative talent setting a table any day is one to admired for beyond superior for most. She is a gracious south lady in every respect. I know she is proud of you too.